Singer Featherweight Darning and Embroidery Hoop #171074 for a Singer 222K. 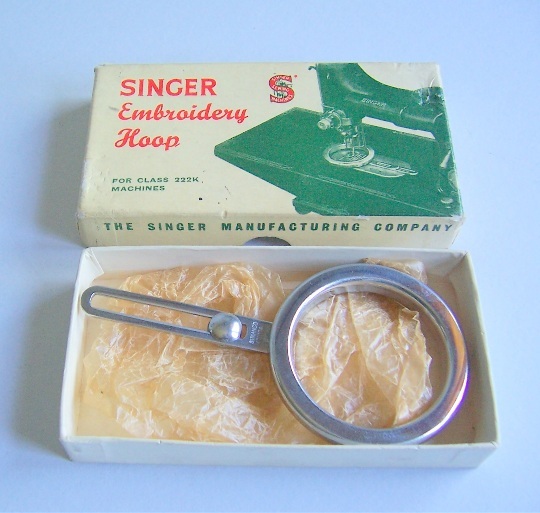 Singer introduced this hoop to be used with the freearm 222K. These hoops were not supplied with the machine, but were purchased separately. Using the hoop, monograming can be done. Used with the spring darning and embroidery attachment 171071 creativity and practicality abound. In addition, you may find the Machine Embroidery Book by Dorothy Benson to be very useful and exciting. Singer made feed dog covers for 221 Featherweights. Authentic Simanco Feed Plates 108002 and 121309 can be difficult to find, but either one will allow you to embroider with a 221 using a conventional embroidery hoop.